Dealing a major blow to President Obama’s controversial executive immigration order, the U.S. Supreme Court announced Thursday it had deadlocked on a lower court’s decision to block the plan, which would’ve provided relief from deportation and work permits to millions of people. Wednesday’s order was immediately hailed by conservatives across the country. Democrats, meanwhile, said this won’t be the end of the road for the policy. Texas and 16 other states initially sued the Obama administration in early December 2014 after the executive action was announced; eight others eventually signed on. Hanen’s decision was upheld twice by the U.S. 5th Circuit Court of Appeals. But the Obama administration countered by saying Texas does not have standing to sue the government and that the president isn’t granting people in the country illegally a free pass. Instead, he’s telling immigration agents to use their limited resources to deport criminals and felons, while simultaneously allowing immigrants deemed low-priority to work and stay with their families. One day before DAPA and the expanded DACA is scheduled to go into effect, Judge Hanen stops the program after ruling the Obama administration did not “comply with the Administrative Procedure Act,” which governs the way regulations are made and how much input the public has. 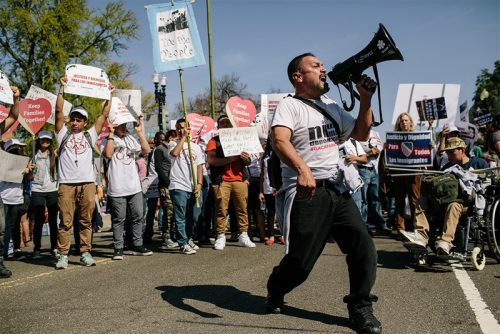 The White House asks a federal appellate court to reverse Hanen’s order, arguing the ruling was without merit because immigration policies fall under the federal government’s purview. In legal filings, the state of Texas accuses the administration of misleading the courtabout issuing work permits. – Julián Aguilar and Madlin Mekelburg, Texas Tribune. This article originally appeared here. This entry was posted in KRTS News and tagged DACA, DAPA, Immigration, Obama Administration, Supreme Court, Texas Tribune. Bookmark the permalink.